The promise of hassle-free returns may keep customers happy, but our latest survey suggests that omnichannel players are still struggling to find the right balance between cost and service. Today's consumers love the convenience of online shopping, but it often takes them a few attempts to find the perfect fit. Retailers have a solution for that. To ensure a "frictionless" online shopping experience, they promise hassle-free returns. Shoes too small? Return them. Pants too long? Return them. Sweater too tight? Return it. And return they do. Today's shoppers do not hesitate to send back items that don't meet their expectations—whether it's a question of fit, quality, damage during shipping, or a host of other reasons. By all accounts, the e-commerce returns rate today runs well into the double digits, with some estimates putting it at 30, 40, or even 50 percent. All this creates big headaches for retailers. That's partly due to the way they're set up. The sophisticated automated systems they've designed for processing high volumes of outgoing orders typically don't run as well when shifted into reverse. And inefficient processes are just the half of it. There's also the added labor, time-consuming worker training, the need to discount inventory, and additional handling and shipping fees. To get a better understanding of how companies are meeting the challenges of reverse logistics in omnichannel commerce, DC Velocity and ARC Advisory Group, a Dedham, Mass.-based technology research firm, teamed up to conduct our fifth annual survey on retail fulfillment practices. (See sidebar for more on our study.) 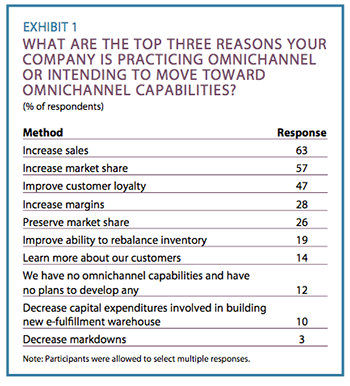 Respondents answered 35 questions on their companies' approach to meeting current challenges in omnichannel commerce and their plans for the future. 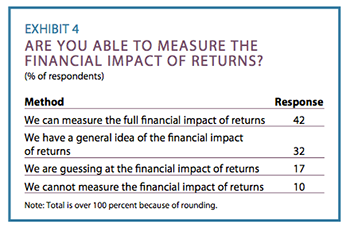 Included in those questions were eight that centered specifically on respondents' returns practices. This article will concentrate largely on the findings from that section of the survey. And the cost of returns only adds to the pain. 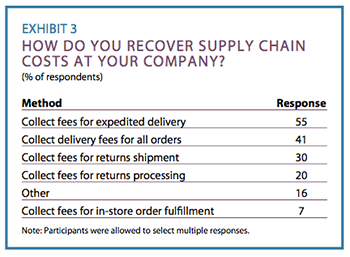 When shoppers return merchandise, a complex, labor-intensive process is set in motion. At the very least, someone has to collect, evaluate, and sort the returns, deciding whether each item should be put back on the retail shelf; returned to a DC for cleaning, refurbishing, and/or repackaging; sold to a clearance reseller; or recycled. The process requires time, training, and money—three resources that are in short supply in any retail organization. Another complicating factor is the number of players involved. In an omnichannel world, by definition, transactions aren't confined to a single conduit. Where once a retailer might have required that items bought in a store be returned to that same location, the field is wide open today. 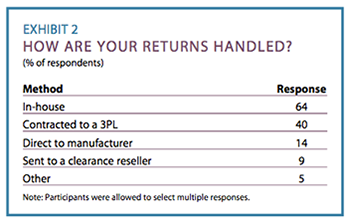 For instance, nearly half of respondents (45 percent) now allow customers to return merchandise bought in a store to a DC or processing center. As the number of players grows, so does the likelihood of complications. These challenges are hardly unique to reverse logistics. Retailers struggle with the same difficulties in the order fulfillment end of their operations. 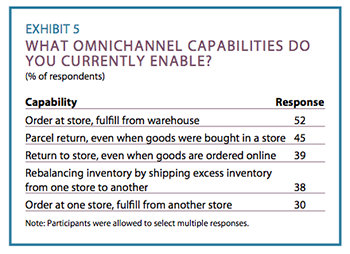 To get a fuller picture of how they're dealing with the online shopping piece of the omnichannel puzzle, the survey also asked respondents a few questions about their fulfillment practices and strategies. As for how retailers currently fulfill e-commerce orders, the results indicated that the industry has yet to settle on a standard approach. While the largest share of respondents, 60 percent, fill orders through a traditional DC that also handles e-commerce orders, that was by no means universal practice. Another 37 percent said items were shipped directly from the manufacturer or supplier, 32 percent said orders were filled from a store, and 25 percent used a Web-only DC. Regardless of how those orders are picked, statistics suggest that a significant percentage of them will be returned. What that means for retailers is clear: Returns management is fast becoming a high-stakes endeavor—and how they handle it could dictate whether they thrive or merely survive in the brave new world of omnichannel. This year's omnichannel study was conducted by ARC Advisory Group in conjunction with DC Velocity. ARC analyst Chris Cunnane oversaw the research and compiled the results. The study explored the details of DC operations that support omnichannel initiatives as well as how companies are handling the challenge of reverse logistics and returns. The findings reported here are based on 142 responses. Respondents included logistics professionals from a variety of industry verticals, who submitted answers during July and August 2017. As for the demographic breakdown, the majority (56 percent) of respondents sold goods through a combination of direct and indirect sales channels. Another 31 percent sold merchandise through direct retail only, and the remaining 13 percent through indirect sales channels only. A report containing a more detailed examination of the omnichannel survey results is available from ARC for a fee. Get information on the report. Read the other part of our special report on omnichannel distribution, "Convenience drives buying trends in an omnichannel world." Feedback: What did you think of this article? We'd like to hear from you. DC VELOCITY is committed to accuracy and clarity in the delivery of important and useful logistics and supply chain news and information. If you find anything in DC VELOCITY you feel is inaccurate or warrants further explanation, please ?Subject=Feedback - : Study: Reverse logistics still a puzzle for omnichannel retailers">contact Chief Editor David Maloney. All comments are eligible for publication in the letters section of DC VELOCITY magazine. Please include you name and the name of the company or organization your work for.